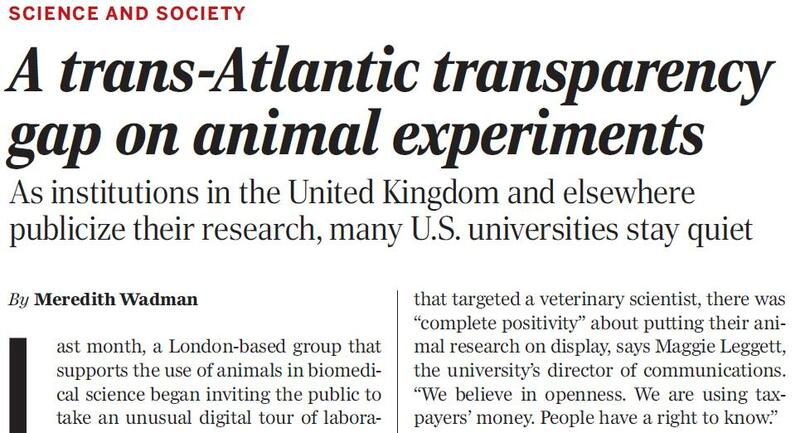 Last month, Science published an article entitled “A trans-Atlantic transparency gap on animal experiments” (online version: To woo public, Europe opens up on animal experiments, but U.S. less transparent”). The article, by Meredith Wadman, noted some of the ways in which US and UK organizations are trying to educate the public about animal experiments including the Lab Animal Tour (UK) and Come See Our World (US) initiatives. However, it also noted differences between the countries – particularly in the university sector. Using the Speaking of Research list of public animal research statements, we can see the trans-Atlantic differences among universities. Of the 65 US universities on the list (a fraction of those that conduct animal research across the whole country), only 8 (12%) get two or more ticks (out of four), and only 3 (5%) get three ticks or more. This compares badly to the UK where, of the 48 universities on the list (representing most universities conducting animal research in the country), 33 (69%) get two or more ticks and 23 (48%) get three or more ticks. The article also brought to light the declines in support for animal research in both countries – though the UK may currently be reversing that trend – something some people attribute to launch and spread of the Concordat on Openness on Animals in Research – where organizations pledge to be more proactive about explaining their animal research. An example of this can be seen in October 2016 when the top ten UK research universities press released the number of animals they used in research that year. It should be noted that most large British universities now post their animal research numbers on their website. 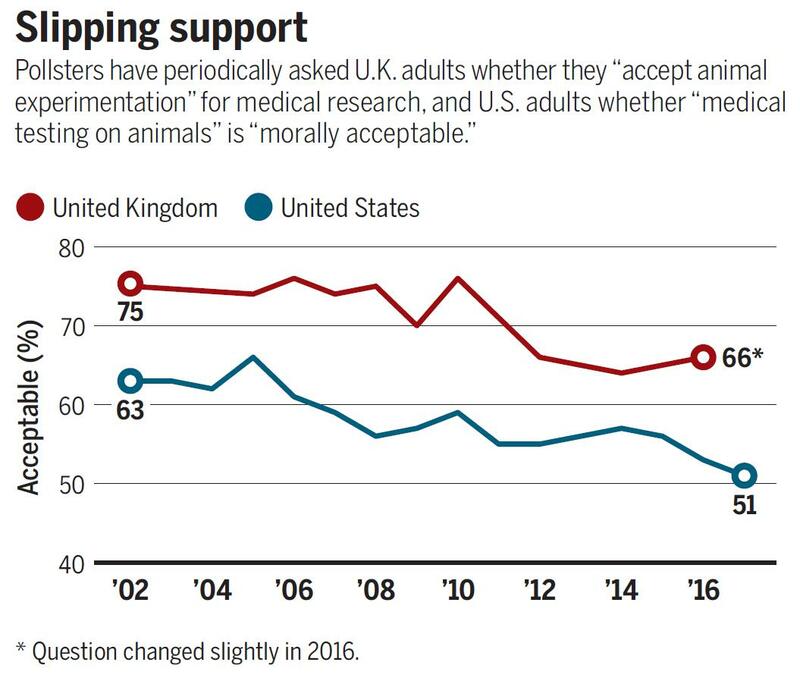 The decline in support for animal research in the US is reflected in other polling also. The Pew Research Center’s polling suggests that support for “animals in scientific research” has fallen from 52% (43% against) in 2009 to 47% support (50% against) in 2014. Many people have questioned whether it is time for a US Concordat to be launched – and certainly Speaking of Research would support any such efforts to make animal research more transparent. The Science article briefly looked at different approaches to animal research advocacy, from the limited information provided by institutions like Harvard, Stanford and John Hopkins, compared to the wealth of information provided by organisations like the University of Wisconsin Madison. While this article only touches the surface of the problem of transparency, and cannot fully be expected to appreciate the huge variation in practice within countries as well as between them, it is still a worthwhile read for anyone interested in how we communicate animal research. Previous Previous post: Research Roundup: GM Pigs and hope for the organ crisis, tiny robots helping to cure bacterial infections and more!